- Date: 04/2014, Series A: $150 k (post valuation: undisclosed amount). 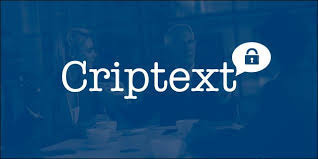 Criptext provides security that goes beyond encryption. Companies, both small and large, require the best security for their electronic communications possible. Without it, costly information leaks are likely to happen, whether unintentional or intentional. Leaks like these cost businesses millions of dollars every year. At Criptext, it is our mission to keep information leaks to a minimum. Our electronic communications security service is the first of its kind. We not only provide end-to-end encryption on emails and text messages. We take security to the next level. Criptext combines ephemerality and control with standard end-to-end encryption for the absolute best in control possible. Our service protects and controls your company’s emails. Criptext treats text message security the same way as email security. All of your employee’s text messages will be encrypted and ephemeral. Message histories are not stored on our device nor on our servers. This enables you to text across your company without the fear of information leakage. Criptext has been featured in the Huffington Post, Yahoo! Finance, The Next Web, Examiner, Epoch times, Wired, Dallas News, and many more for their groundbreaking secure technology. Criptext is communication service that protects the confidentiality of your entire organization while decreasing the risk of leakage of information. What makes criptext criptext unique is that, aside from encrypting information, it gives the user complete control of all the emails/texts they send. Faster, Smarter, and top engineering talent Criptext is making waves in the secure messaging applicaton and desktop space.